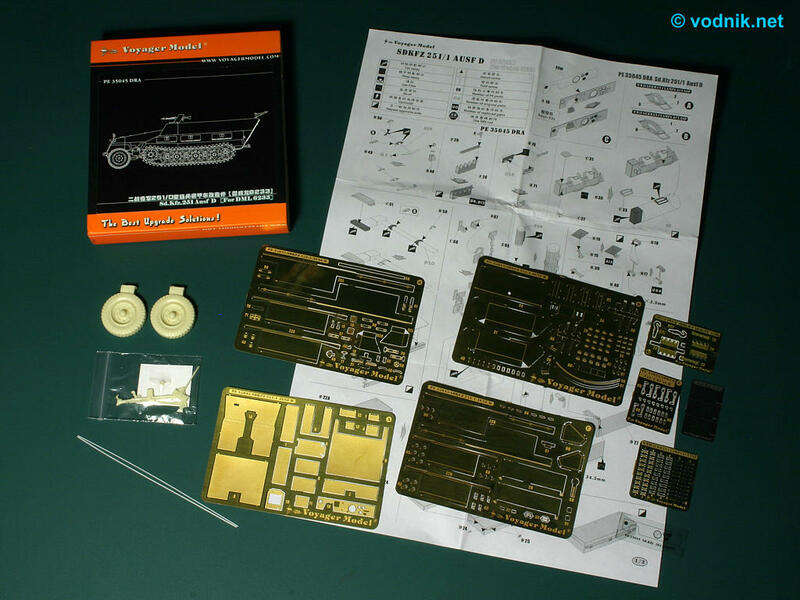 The set is designed for Dragon's "three in one" Sd.Kfz.251 Ausf.D kit and it includes parts to improve details in the basic 251/1 variant (there is also additional set #35043 from Voyager with parts specific to 251/9 7.5cm KwK37 (L/24) version). 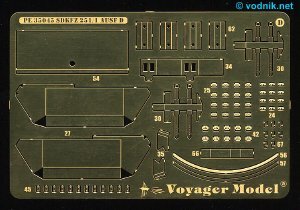 This set, while described as "PE Update" in instructions, is much more than that as aside from photo-etched parts, it also includes resin and plastic pieces. The set is packed in a new style packaging. 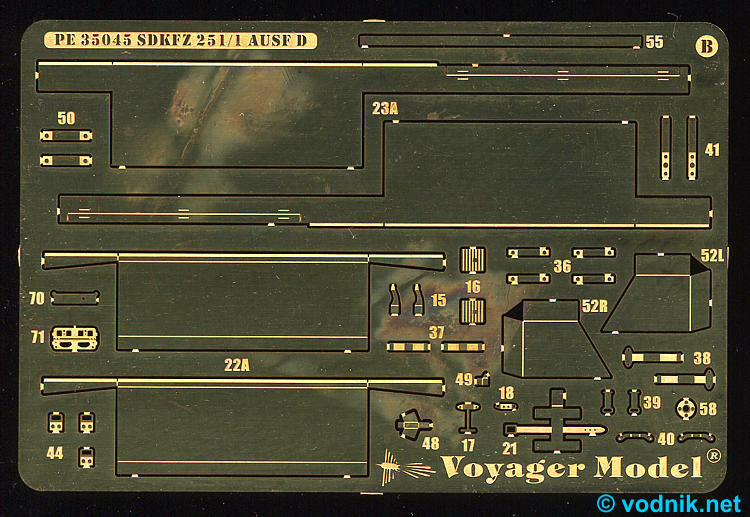 "CD case" type paper card envelopes previously used by Voyager were replaced by similar in size, but much thicker card boxes. The familiar black and orange design of boxes however was retained. New packaging gives more space inside to include resin parts. 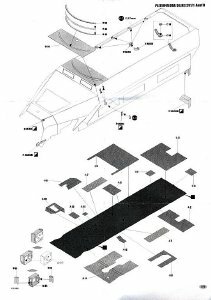 Inside the box of set 35045 we find instructions printed on both sides of A4 size paper sheet and two re-sealable plastic bags. The bigger bag with all the PE parts on 8 frets inside is attached to the rectangle of stiff paper for protection. In this bag are also ABS plastic rods and printed acetate part. 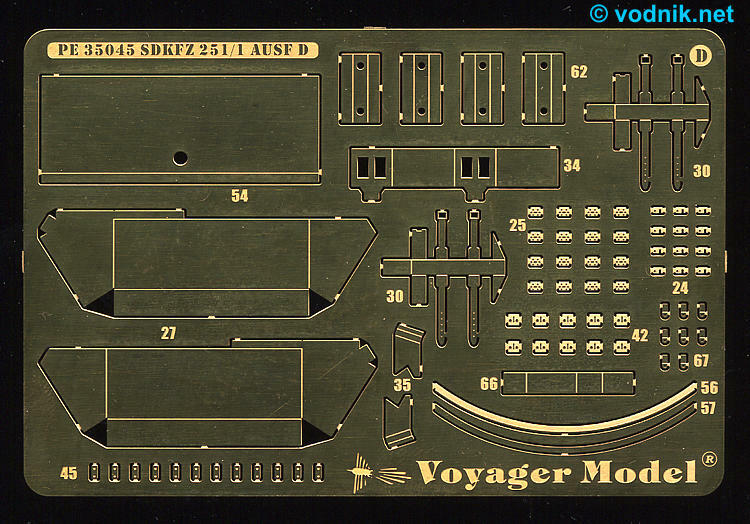 On the back side of the box is a drawing showing the contents of the set, but it is misleading, as a few of shown PE frets are different from these included in the set. 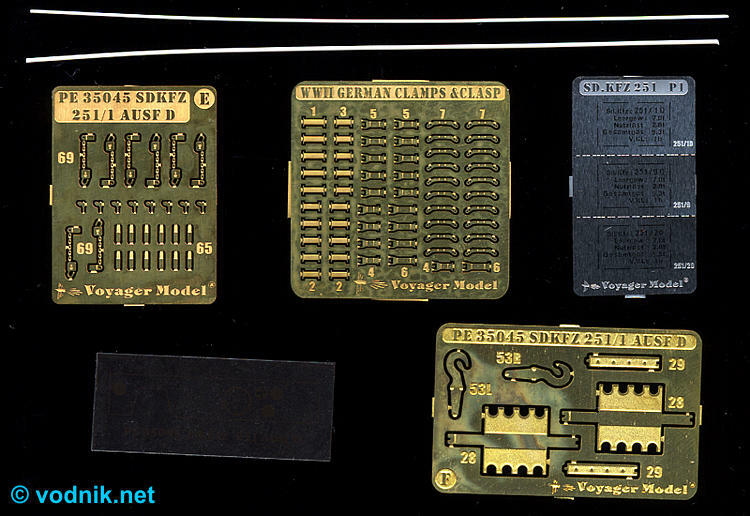 The content of the set is correct for this product, so the picture is wrong (it shows some frets from the #35043 set) and cannot be used to check the completeness of the package. WW2 German Clamps & Clasps - 32 mm x 32 mm / 0.15 mm thick copper. - tiny switch console for dashboard. 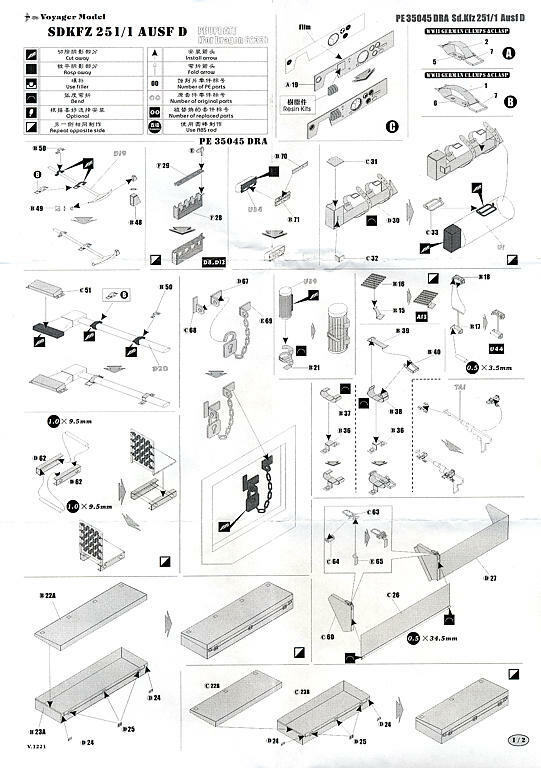 Additional parts are two approx. 100 mm long ABS rods - one 0.45 and the other 0.6 mm diameter (although instructions call for use of 0.5 and 1mm diameter rods!) - and a piece of clear acetate with dashboard instrument faces printed on it. - stencils (P1) for painting vehicle type and weight data for 251/1D, 251/9D and 251/20 vehicles, to use instead of decals included in Dragon kit. 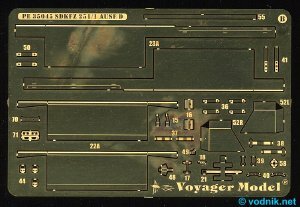 - dashboard (with extra resin detail and clear acetate instrument faces). - clamps for tools and weapons (with resin ax and pickax also included). 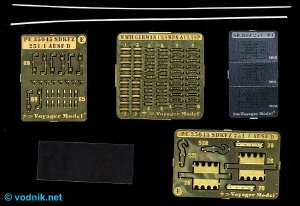 Thanks to the inclusion of complete PE fret from the WWII German Clamps & Clasps set we get more tool clamps than is needed for this one model. - padlocks with chains for storage boxes. - side bins and a few complete storage boxes. - roof section above the driver's compartment. 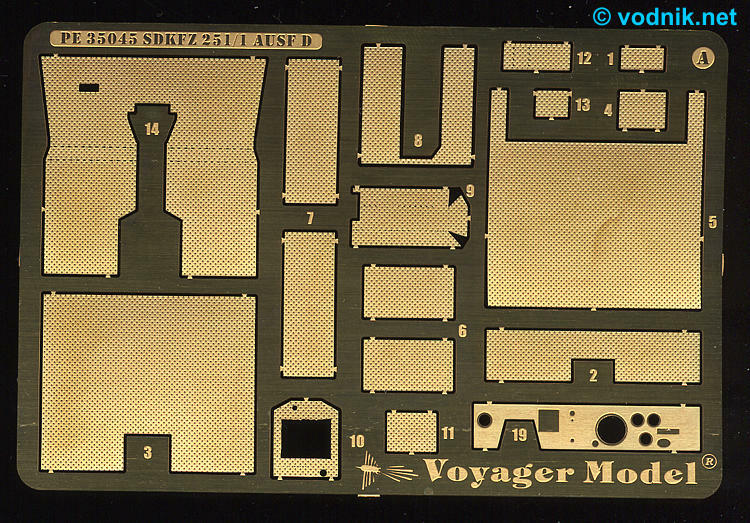 - replacement floor plates with fine non-skid pattern (requires removal of molded-on details from kit part). - rails for the vehicle interior sides - with PE brackets and ABS rod bars. 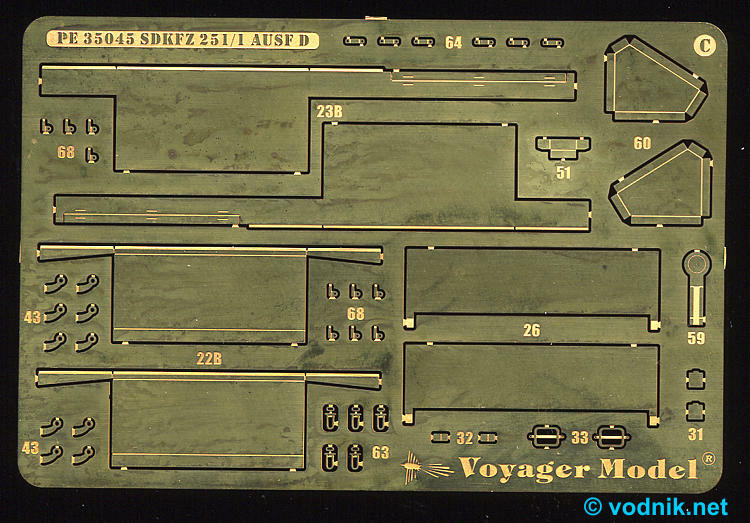 - many other small details parts which I unfortunately cannot identify (see instructions scans). Click on picture to enlarge it. Photo-etched fret D.
Small PE frets, clear acetate sheet and ABS rods. 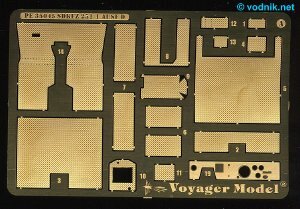 The quality of etched parts is very high and they include really tiny details, so some care is needed when removing them from frets. 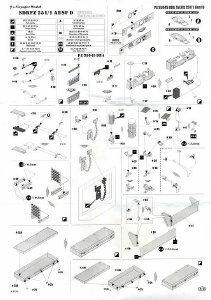 The assembly of some small parts, like tool clamps, may be tricky and it requires a stable hand, good tools and some patience, but once assembled, those details should look great. 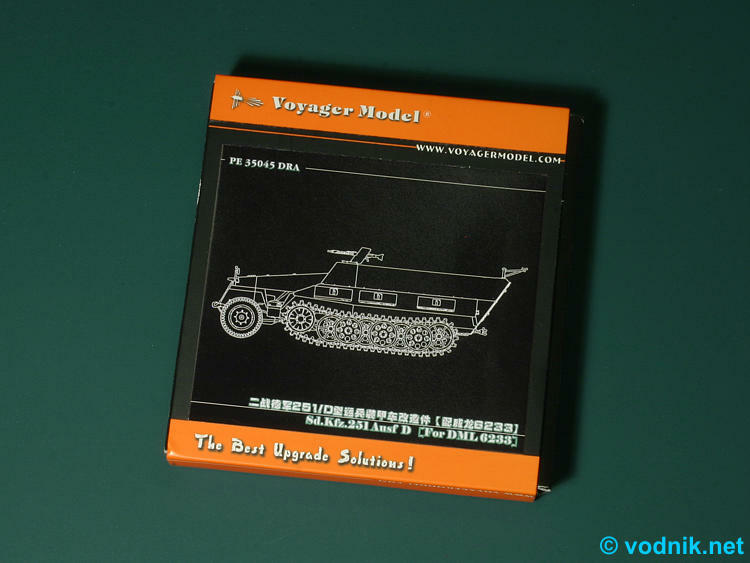 Modelers with no experience with PE parts probably should not start their adventure with this kind of aftermarket products from this set. 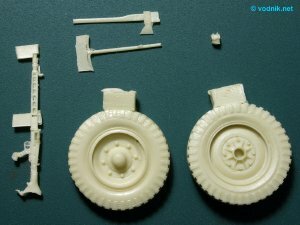 Resin parts are nice addition and the quality of casting is very good with no air bubbles and crisp details. To my (overly geometry sensitive) eye the resin wheels are a tiny little bit deformed and the shape is not perfectly regular (and I don't mean weight flattening, which is well done), but it is a common problem of resin wheels and in this case the deformation is really minimal. Instructions are very clear, but do not mention resin wheels or MG42. Luckily these parts simply replace kit parts. Also not mentioned are painting stencils, but it should not be too difficult to figure out how to use them. 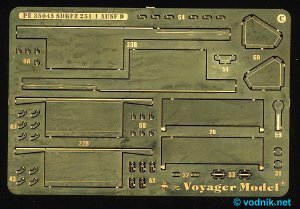 Another nice set from Voyager and addition of ABS rods, resin parts and inclusion of photo-etched frets of different thickness significantly increase its value in comparison to usual PE-only sets.